1) This circuits made by two series SCRs are unlikely switching devices for this chopper circuits DC to DC converter. 2) It has an intermediate resonant link that facilitates self-commutation of each of the SCRs Thyristors. 3) SCRs of both input and output currents are discontinuous thus requiring appropriately sized low impedance capacitors. 4) Switching frequency is two orders of magnitude higher than the line frequency so relatively small L-C components may be used. 5) It is applied much like the standard buck regulator to reduce voltage by Thyristors. 6) This discussion covers the operation and feasibility of this topology rather than a practical circuit –an evaluation circuit is provided. 7) Practical thyristor circuits will be the subject of future discussions. Note that this topology appears to be new to the world and may possibly spark a revived interest in SCRs. 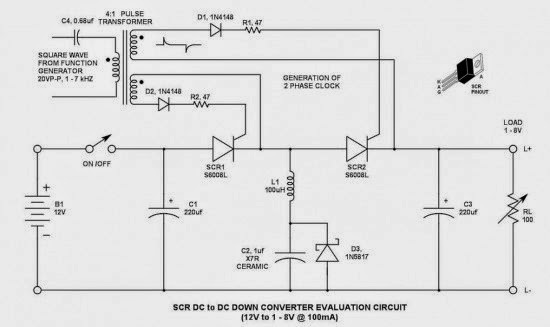 0 Response to "DC Chopper Circuit Using Thyristors-SCRs"